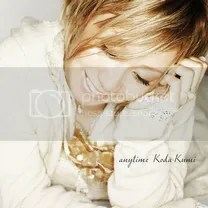 anytime is the thirty-ninth single by Japanese singer Koda Kumi, released on January 23, 2008. The title track was used as the commercial song for Kirin’s “Kirin Chuuhai Hyouketsu” and “music.jp”. The single reached #4 on the Oricon weekly charts and charted for 5 weeks. It sold 43,051 units in it’s first week and the most recent figures show that it sold a total of 53,189 units. I have always liked anytime and for a long time it was my absolute favorite of the Kingdom album. I still like it nowadays, even though my musical taste has developed even more. What I like so much about this song is that it’s so sweet and airy, even like a summer song (while it was released in January). This was supposed to be on the ‘FREAKY’ single, but thankfully they deleted it and gave it its own release (it wouldn’t have fit on that single anyway). I’ll even take Kuu’s pitchy vocals (which she tends to have at times). Bounce is a Rosette cover, I don’t know the original but Kuu ‘Japanesed’ it apparently. It spices up the single with its fast paced rhythm and catchy hooks and it gets better the longer I listen to it. Sometimes it reminds me a little of Kuu’s earlier days when she was just getting started, it has this slight turn-of-the-century sound. Quite nice. Oof, a remix of over seven minutes. They sped up anytime FreeTEMPO Remix a lot so the vocals sound a little unnatural and it takes a little longer for things to get really interesting, at first its just Kuu and a piano. Later on they add strings and a dance beat. It kind of kills the sweetness the original song had and that isn’t a problem per se, I just don’t dig what they did to it.